This will be the tall hotel cup 3610. It seems kind of obvious anyway, but I have good reason to be sure as I just bought a 3629 "as 3610 with two handles" in a post-auction offer on trademe. There are only two two-handle items in the 3600s gallery and the other is taken. Images on the sale item are just home-applied transfers. When it arrives I will clean it and post a pic. It was not cheap but certainly unusual, which was good reason to buy. And it confirms not one but two items for the vitrified cup gallery. Oh wow .... I watched that two handled cup, but thought it was a bit dear, especially with postage included! Yes, I've had that shape as a 3610 in my files for yonks as this is the shape number for the Hospital Cup, but needed confirmation. Since realising that this cup shape only dates from 1964 has always puzzled me as it looks as though it should be older. As I was making a comparison of block handles on Ambrico cups I thought I should throw this block-handle cup into the mix. Not only does the handle of the 3610 vit cup follow a trend dating from the earliest Ambrico cup shape, but it also closely mimics the silhouette of this particular Ambrico cup. The 3610 made a belated reference to earlier designs at a time when Crown Lynn was updating its entire cup range to produce the 780 and 781 (South Pacific and tulip) coffee and tea cups, the 859 e/w and vit 773 demitasses (all early 1960s), and the breakfast cup (1965), as well as introducing some new shapes (782 coffee can early 1960s, 783 Air NZ cup, 3012 bevel bottom, and 3013 Thorpe). 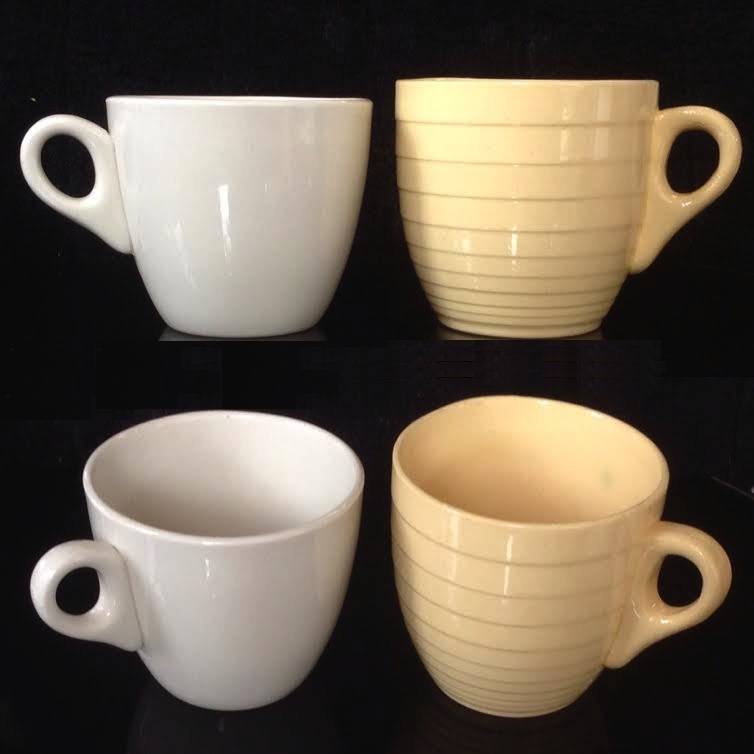 The handle for the first Ambrico cup was also the starting point for the handles on the 700 NZR cups, which had at least two further variations, and the handle on the 755 Carlton cup, which also had a few variations. I will look into those another time. 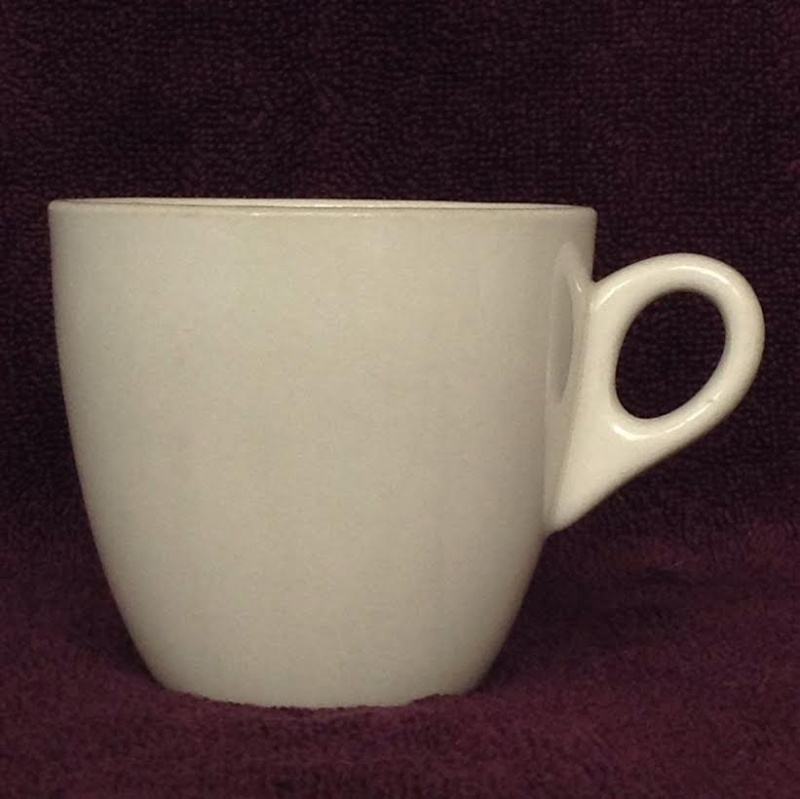 I have a older looking white cup that looks like your photo - it is very heavy and has thick walls - if that makes sense. I often wonder if it was an early crown lynn or not. Would it be the same as yours Jeremy? I've seen many of these vitrified cup shapes with English pottery stamps. This observation about shape similarity is part of the bigger package I am looking at wrt the general evolution of CL cup shapes. Essentially when Ambrico became CL they already had quite a few cup shapes, which were retained, with modification. I have been looking at the early shapes to see whether later shapes were new or modifications. So far I have 6 different Ambrico cup shapes (different combinations of body and handle not including 700 and 755 shapes), and hope to get a seventh. These include the "3610" shape and the 532/780 shape. The "Potters Wheel" film shows that by 1949 CL already had a "752" or "754", but I have yet to find a "781"-type tulip shape prior to 1955 and expect that the early ones did not arrive until very late in that decade. Janice, the big cup in the montage above is Jim's: unfortunately I do not have one. It is huge. It is crazed so I am thinking eathenware but not sure. Gail Henry describes it as "The first piece of non-industrial ceramic made at AMBRICO" [her caps, page 187]. I include it as the first Ambrico block handle. Check out the book for comparison. Jim's one is nearly white rather than the classic straw colour of early Ambrico wares. All other cups in the montage, with the exception of the 3610, right, are also Ambrico (or at least very early CL). Ev, I recognise that Ambrico/CL did not work in a vacuum, that they copied designs from overseas potteries (I also have a Bristille cup very similar to the 3610) but I also recognise that once they had a shape it was repeatedly reworked over time. You have told me how the records show constant tweaking to designs. I'm attempting to track shapes back to Ambrico originals. The only vit shape here is the 3610. I started looking at these block handles in the hope that my Refreshment Rooms cup http://www.newzealandpottery.net/t5052-n-z-rly-refreshment-rooms-crown-lynn-saucer#18738 would turn out to be CL but unfortunately not. I have found shape match and stamp match to Grindley, so Grindley may be the source for the Ambrico plain block handle but there were a few other makers of NZR railway cups too, so plenty already in NZ for Tom Clark to copy. I have read how Ambrico had difficulty getting handles to stick and that many were tried but I am absolutely astounded that so many are still around. 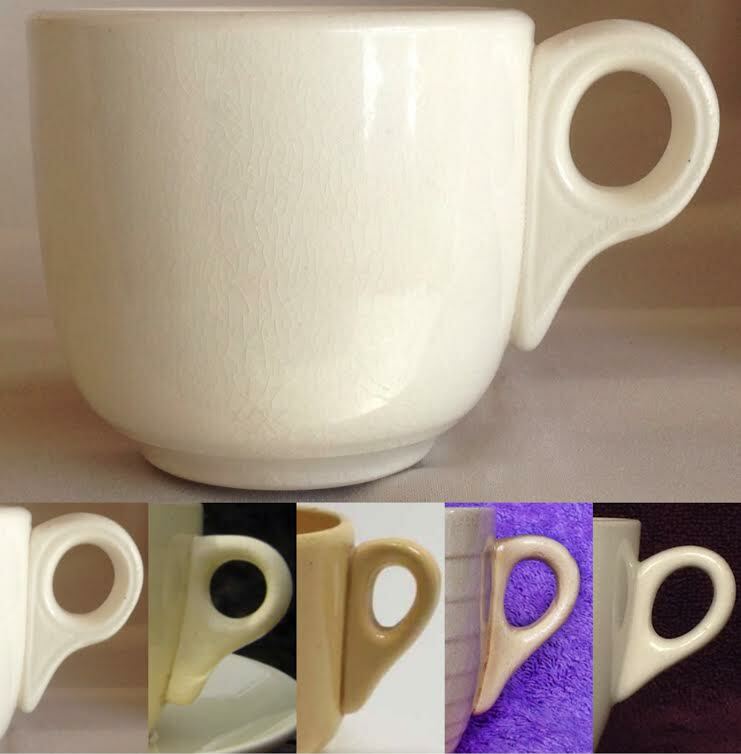 The cup shape shown here had many alternative including two very similar but also distinctly different block handles. The one I have shown here differs, for example, from the one at Auckland Museum in weight (this one lighter) and shape of hole (ovoid vs circular); I have just bought what appears to be a match for the Museum cup and will compare them more closely when it arrives. I consider the handle oversized and clunky for the "Paris" cup but likely also the earliest so historically significant.